Sweden has about 450,000 km2 and a population close to 9 million. About 80% live in urban areas. Sweden has developed from settlements after the last ice period. The present country was unified into one kingdom around 1000. During medieval time, it was sometimes a union between Norway, Sweden and Denmark. The modern kingdom was established around 1500 and the democratic state around 1900. Finland and the Baltic States have for different periods been included in the Swedish kingdom and been influenced by the Swedish cadastral system. Sweden is one State with one central government and parliament. The king has no political power. For administrative purposes, the country is dived into 21 counties and 280 municipalities. At county level, the State has a regional administration through the county administrative board. There is also a direct elected council with own right to levy taxes and responsible mainly for health care at county level. Most social welfare issues as well as land use planning are the responsibility of the municipalities, who also have direct elected parliament and own right to levy taxes. The ministries in the central government are small organisations, mainly dealing with policy formulation and preparation of proposals to the parliament. The central administration is carried out by national authorities and agencies, which, within the framework of the legislation and budget frames, have to carry out the implementation of the policy, independently. All governmental decisions have to be taken by the collectively within the government. The government cannot interfere in the decision-making in a national agency. The modern Swedish cadastre is based on cadastral books from 1530, established for taxation purposes by the king. These books list real properties village by village and give every unit a number in the village. This numbering system is still used for designation of real properties. During the 17th century these books were complemented by village cadastral maps, showing all real parcels in the village. The purpose of these maps was mainly to improve the taxation of land and make it more just and equal, by surveying the area and value of each land parcel. In order to carry out this task, Lantmäteriet (National Land Survey) was created 1628 as a governmental organisation. Land registrations (land titles) have been confirmed since beginning of history by local courts in order to make it known that a property has changed ownership. Written documents are available from medieval time. 1875 a title registration system was introduced. Court proceedings was compared to the cadastral books and maps and a special registry was established, the real property register in order to give one definition of a real property and a designation to this unit. The title registration system was based on the real property register and the description of the property in the real property register. The real property register was established during a 20-year period from 1910-1930. In the 1930s a work to establish a comprehensive and coherent national map in one national geodetic system was started. From the beginning, these maps were based on aerial photography, photo mosaics and later orthophotos. The maps were named economic maps and were produced in scales from 1:5,000-1:20,000. Cadastral boundaries were transferred from the old village maps to the new system by mainly photo interpretation of the boundaries and comparison with the old maps. There were no attempts to calculate new areas for the property units. This mapping programme was finished 1978 and is now maintained and complemented with land use plans, regulation and other features of importance for land use rights. Another important development is that the original cadastral books with its division of the village into real properties also started (around 1600) to be used for recording of the population (birth, death and place of living) by the church, which at that time was a State Church. This recording has been maintained since then and today been taken over by the Tax Authority. In this way all people living in Sweden are connected to a real property in a continuously updated census. This is today a very important possibility for use of land information and social data for public and private planning and administration. The church books are a very interesting source for genealogical research. In the 1960s a governmental investigation started to look into the question on how the books in the real property register could be modernised. It came out with the proposal to computerise the real property register. One of the main advantages was seen in the possibility to combine information in the real property register with the population register through the property designation and thus make spatial analysis to support physical and economical planning. For this purpose each real property was assigned a centroïd coordinate in the national system. This was actually one of the pioneer works, which later led to the development of Geographic Information Systems, GIS. The decision to computerise the real property register was taken 1968 and the land registry 1970. The system was developed and the first county started with legal force 1975. The system was completed for the whole of Sweden in 1995. The computerisation of cadastral maps has been made in two ways. First, cadastral parcels were digitised from the economic map, which now is totally digital and has changed name to the real property map. Secondly, surveys of each parcel and parcel (cadastral) maps have been transferred to more accurate cadastral data bases, which have been integrated with the land information system. This process has included many problems in order to link various local geodetic systems into one national system. Lantmäteriet is a governmental authority responsible for real property formation and official real property and geographic information. In government, it is represented through the Ministry of Health and Social Affairs. It has a national office in Gävle and approximately 90 regional and local offices spread over the country. There are also about 38 municipalities with offices for real property formation. Lantmäteriet is responsible for the land information system supporting cadastral and land registration. The responsibility for land registration (title registration) was transferred from the National Courts Administration to Lantmäteriet in 2008. There are seven land registry offices throughout the country. They update the land registry which is an integrated part of the land information system. Taxation authorities are responsible for the Real Property Taxation Registry and the Population Registry, which are both linked to the land information system through the real property designation. Lantmäteriet is also responsible for the National Apartment Registry that was established in 2010. The private sector is not involved in the official land or cadastral registration, nor in cadastral surveying. The private sector can only be involved as consultants or advisors to a client in particular cases. Professional surveyors, land administrators and valuers are organised in the association Aspect that has about 2000 members. There is no licensing system. There is a demand on competence to work as head of a cadastral office, which is at least 2 years relevant practice and a Master Degree in land surveying/land administration. A Master’s Degree in land surveying/land administration/real property economics can be obtained at the Royal Technical University in Stockholm and the Technical University in Lund. A Bachelor of Science can be obtained at the University Colleges of Trollhättan, Karlstad and Gävle. Provide land information for land titling, land use planning, land taxation, environmental control and business development. From previous situation with different system for urban and rural areas, the system is today one unified system valid for all types of land, also governmental. According to the Swedish Land Code, all land is divided into real properties. The extension of each real property is defined by the description in the Real Property Registry. A real property unit can consist of one or many land parcels, water parcels or the specific right for fishing within a designated parcel. From 2004 a real property unit can be defined in three dimensions and from 2009 as a single apartment. Objects permanently attached to a real property unit outside its boundaries still belong to that property unit if secured by a legal right (servitude or easement). Figure 1: Example of cadastral map. The cadastral index map is widely used in land administration as reference and for planning purposes. It is available in digital formats for viewing or GIS analysis. From 2000-2010 Lantmäteriet and the municipal offices have collaborated to integrate the best available cadastral information in the national cadastral index map. The cadastral index map is now shared between different branches of public administration through a national geodata strategy based on the INSPIRE directive. The cadastral index map is part of the geodata services provided by Lantmäteriet together with topographic maps and other services. It is used for a wide range of purposes within the public and private sector. Lantmäteriet is the national coordinator for the National Spatial Infrastructure in Sweden in accordance with the INSPIRE Directive. An ongoing activity is to improve accuracy, completeness and contents of the cadastre. Efficiency, accessibility and services are consistently developed to improve and enhance the use of the cadastre in land management and related sectors. The implementation of the INSPIRE directive is a prioritised activity as well as participation in other international and EC activities such as EULIS/LINE. The commercial division of Lantmäteriet, Metria, was separated into a state owned company in 2011. Metria provides services in field surveying, mapping, remote sensing and GIS. The aim of this operation was to achieve a clear distinction between the role of Lantmäteriet as an authority and other more commercial activities. 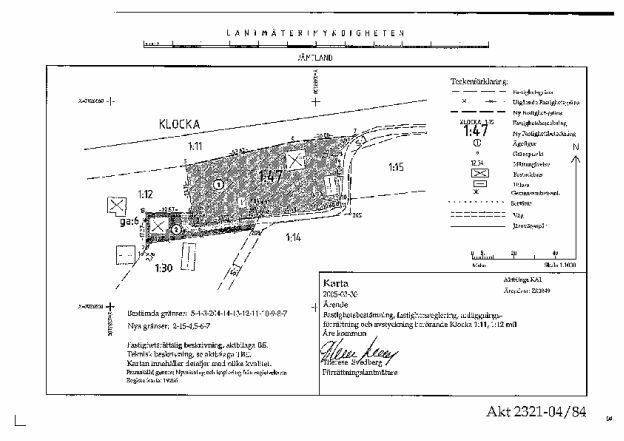 Following the transfer of the Land Registry to Lantmäteriet in 2008 the work has now begun to integrate the processes for cadastral and land registration. This will in the future lead to faster service delivery and increased legal security for the public and for society in general. Lantmäteriet has a vision to be a leading national actor in the field of e-services. The vision has been expressed in the terms “See, Smile and Give” and will mainstream all activities in the coming years. The government has also given Lantmäteriet the task to coordinate the efforts of developing e-government services within the field of geodata in the Swedish governmental administration.